How often do we get caught up in a cycle of exhaustion? Are we aware of the damage that we do to our mind, body, and spirit when we go too hard for too long? The truth is we need rest from our work. Many of us remember that God rested on the seventh day, but do we understand the significance of this? It is unfortunate that people have felt this to be a imposed belief because it is a rule for health for the mind, body, and spirit. 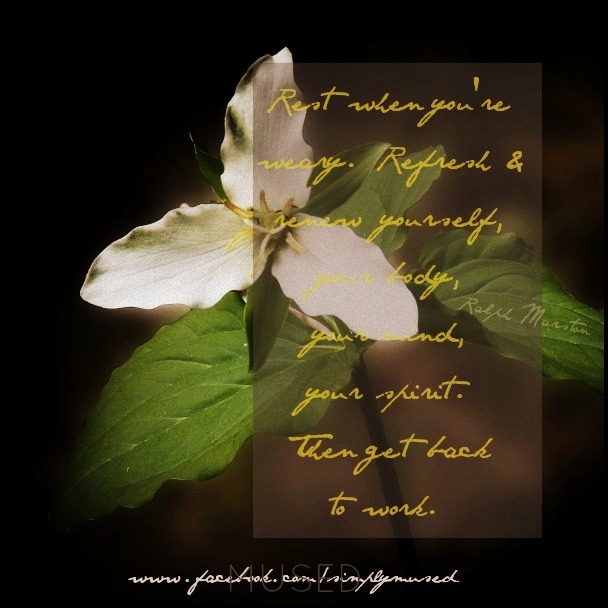 For the last 14 years, I have practiced rest, rejuvenation, and spiritual focus on Sunday. In the beginning the rewards of this practice were profound, and I have found that when I closely observe for the day a routine that nurtures my soul, such peace comes to me that it sustains me for the following week. How does this pertain to creativity? Well, it stills the loudness of the world and helps to bring to focus that quiet voice of intuition. This is a hard phenomenon to explain because it is one that needs to be practiced to be observed This is one reason why I titled this series Practical Creativity. A level of understanding comes from reading and mentally comprehending it, but the understanding that makes the real impact is at the level of practice and eventually habit. This is not only the case for today’s practice, but for each day of the week. Each day a practice was given to work on and each of those rewards of added creativity will only truly comprehended as they are put into practicality. I hope that you have enjoyed reading my daily thoughts as much as I have enjoyed and looked forward to writing them for you. Happy creating! It is your nature.